When Captain James Cook arrived in the Islands in 1778, he and his crew were the first Westerners to observe the rich Polynesian culture that had evolved over the course of centuries. As specially adapted as the plants and animals that thrived so far from other land, the Hawaiian people had learned to use their resources with ingenuity, skill and art, developing a lifestyle of abundance, deep spirituality and ample leisure. Cook's arrival marked the advent of a new era for Hawai`i, a time of monumental change that included opportunities, admiration and sharing as well as destruction, disease and death. Cook's own visit was a mixture of pleasure and pain as cultural signals were exchanged but often missed their mark. The encounter - like so many others - ended in death when Hawaiians killed Cook during a skirmish. Even though Cook's body never left the Islands, his published journals brought Hawai`i to the rest of the world and the Islands were never again left in isolation. After Cook came George Vancouver, another British navigator, and after him came other ships from France, Russia, America and elsewhere. 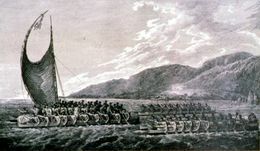 Cook's voyages coincided with a period of political consolidation and wars in Hawai`i during which Kamehameha took control of the main islands. By 1795 the island chain was firmly under his rule with only Kaua`i and Ni`ihau eluding his grasp (Kamehameha won those islands through diplomatic efforts in 1809). Kamehameha exploited the novelty of Western technology to vanquish his enemies - wooden spears and clubs were no match for cannon and muskets - but he also understood the seductive qualities of Western culture and the danger they posed to his people. While he reigned, Kamehameha took care to strictly control foreigners’ interactions with natives. Vast changes took place after the death of Kamehameha in 1819. His son Liholiho took over as ruler. Closely advised by Kamehameha's widows, Keopuolani and Ka`ahumanu, Liholiho challenged the backbone of Hawaiian society by breaking the kapu, or ritual restrictions that governed many aspects of social behavior. Liholiho's actions effectively toppled the old Hawaiian religion without providing an alternate belief system. It was at this opportune moment - in 1820, just months after the breaking of the kapu - that American Protestant missionaries arrived on the scene. Over the ensuing decades, this determined group of pioneers had a huge impact in the Islands. Beginning with the introduction of Christianity and its attendant moral teachings, they also recorded the Hawaiian language and assisted its transformation from an oral tradition to a written language. As the years wore on, many missionaries and their descendents became active in business and they and their companies eventually controlled almost all of the local economy. Economic power translated easily into political power and members of missionary families remain prominent in island society, business and politics today. As adventurers and traders began to frequent the Islands, the native subsistence economy changed to accommodate foreigners and foreign goods. Hawaiians acquired new materials and products - everything from iron tools to expensive furniture and fabrics that were not necessarily put to practical use but were valued as status symbols. New animals and plants arrived as well. Grazing animals like cattle, goats and sheep and invasive plant species made a major impact on the environment, drastically altering forests and overrunning defenseless native species. Hawaiians themselves caused serious damage as they cashed in on Chinese demand for sandalwood. With trade still controlled by ali`i, individual chiefs made fortunes by denuding the forests they controlled. The sandalwood trade breezed through its boom and bust cycle in fairly short order, but it was soon replaced by whaling. American and European whalers hunting in Arctic waters wintered in Hawai`i, their resupply needs supporting new ventures in farming and cattle ranching. Old traditions of farming and fishing deteriorated as a cash economy took over trade transactions. The changing economics mirrored changes throughout Hawaiian society. The king instituted a formal change in land tenure in 1848 with the Mahele.